Researchers identify how tuberculosis uses precision medicine to trick the immune system. Tuberculosis is caused by the bacterium Mycobacterium tuberculosis and it affects over 12 million people globally. When the bacterium infects a person, the body’s immune response is critical to how the disease will progress; either helping the body fight the bacterium or, if certain key molecules become involved, actually exacerbating the infection. Now, EPFL researchers show how the tuberculosis bacterium co-opts mechanisms of the immune system to its own advantage. The opensource study is published in the journal Cell Host & Microbe. The team state that when M. tuberculosis infects a person, it attacks the lungs’ first-response immune cells, the macrophages. The immune response by the macrophages involves a complex of four different proteins called the inflammasome. The main role of the inflammasome is to prepare certain immunity proteins in the macrophages, which are called interleukins. When M. tuberculosis infects the lungs, interleukins from the macrophages are in the first line of defense. However, previous studies show that if it is left uncontrolled, this defense can also cause serious damage to the patient. To prevent this, macrophages also release another group of proteins called type I interferons. While interferons are important for defending the body against viruses, when it comes to tuberculosis they actually help the bacterium, thereby exacerbating the disease. And although the interleukin-inflammation part of the immune response is rather well documented, the part involving interferons has been elusive, state the team. For the first time the current study shows how M. tuberculosis carries out a subtle assault on the immune defenses. The data findings show that the key is a molecule called cGAS, which is found in the lung’s macrophages, and is part of a group of DNA-sensor molecules; in short, cGAS patrols the inside of macrophages, and when it detects unidentified pieces of DNA, such as those released by M. tuberculosis, it triggers an immune response from the macrophages. The tuberculosis bacterium uses a specialized secretion system to release its array of toxic proteins into macrophages. But, strangely, it also releases small bits of DNA, which are detected by sensing systems inside the macrophages, namely the inflammasome and cGAS. This causes macrophages to release two types of proteins; namely interleukin-1, which fights the bacterium, and type I interferons, which end up helping it. The team used human and animal macrophages to study what happens when they are infected by M. tuberculosis. What they found was that the bacterium passes DNA bits into the macrophages, thereby tricking cGAS to signal the production of interferons, which reduce the immune response. In other words, the bacterium tricks the macrophages to cut back on their defense against it. And the researchers did not stop there. They also showed that it is possible to manipulate M. tuberculosis in such a way that it can no longer activate the production of interferons through cGAS, while still keeping the production of interleukin-1, and thus the body’s immune response, intact. The team state that the study is the first to identify cGAS as a sensor for M. tuberculosis DNA, and also suggests that this method of molecular manipulation applies to other bacteria that use specialized secretion systems to infect cells. The team surmise that the results show that tuberculosis is a far more sophisticated disease than previously thought and are now working, among other projects, to identify the DNA pieces that M. tuberculosis uses to trick macrophages. Cytosolic detection of microbial products is essential for the initiation of an innate immune response against intracellular pathogens such as Mycobacterium tuberculosis (Mtb). 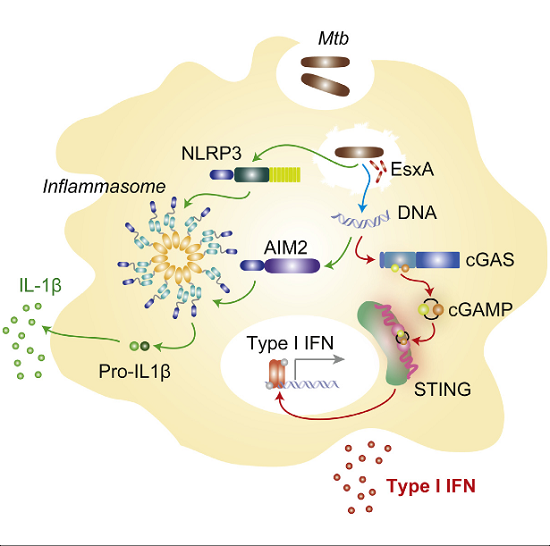 During Mtb infection of macrophages, activation of cytosolic surveillance pathways is dependent on the mycobacterial ESX-1 secretion system and leads to type I interferon (IFN) and interleukin-1β (IL-1β) production. Whereas the inflammasome regulates IL-1β secretion, the receptor(s) responsible for the activation of type I IFNs has remained elusive. We demonstrate that the cytosolic DNA sensor cyclic GMP-AMP synthase (cGAS) is essential for initiating an IFN response to Mtb infection. cGAS associates with Mtb DNA in the cytosol to stimulate cyclic GAMP (cGAMP) synthesis. Notably, activation of cGAS-dependent cytosolic host responses can be uncoupled from inflammasome activation by modulating the secretion of ESX-1 substrates. Our findings identify cGAS as an innate sensor of Mtb and provide insight into how ESX-1 controls the activation of specific intracellular recognition pathways. Mycobacterium tuberculosis Differentially Activates cGAS- and Inflammasome-Dependent Intracellular Immune Responses through ESX-1. Ablasser et al 2015.